Rob Ford has been a one-man headliner generator for more than a year, but his time in the spotlight might be ending. The Toronto mayor was diagnosed with an abdominal tumor this week, forcing him to drop out of the Oct. 27 election. On Friday, Ford announced that Rob's brother, Doug Ford, will run for mayor in his place as he prepares for biopsy results due back next week. 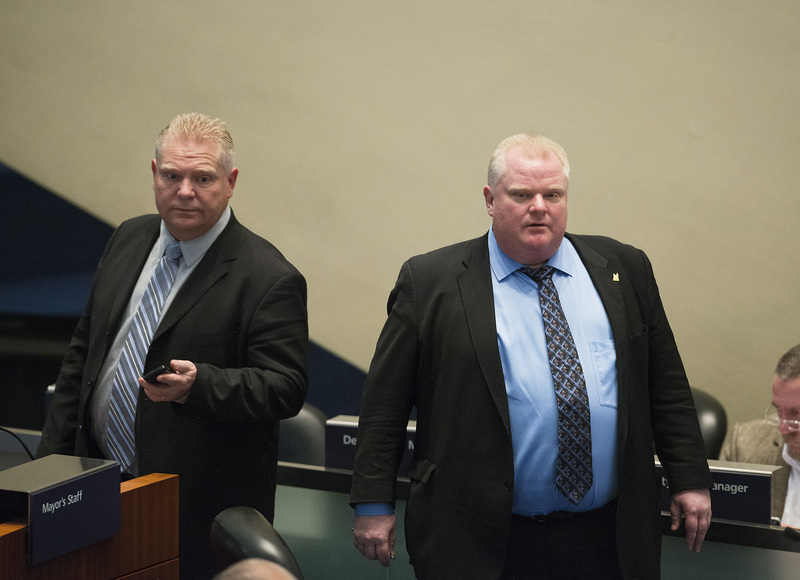 Ford announced his bid withdraw in a statement, which simultaneously acted as an endorsement for his brother. Doug loves our city as much as I do. He believes that standing up for the average person and watching the bottom line are what matters most at City Hall. Doug also believes in standing up for his family no matter what. His loyalty and willingness to be there for anyone, anytime is just who he is. I’ve asked Doug to finish what we started together, so that all we’ve accomplished isn’t washed away. I have asked Doug to run to become the next Mayor of Toronto, because we need him. We cannot go backwards. The statement also mentions Ford's plans to instead run as Councillor of Ward 2, which is Doug's current position and one that Ford previously held from 2000 to 2010. So, basically, the two brothers would be trading places. And while Ford undergoes MRI scans at Mount Sinai hospital on Friday and awaits the biopsy results, the rest of the world is getting to know his older brother. Who Is Doug Ford, Anyway? Even though Doug is older, he's made a career succeeding little brother Rob. After Ford won the Toronto mayoral race in 2010, Doug took over his position as Councillor of Ward 2 in Etobicoke. Since taking on the role, Doug has served on several committees, including the Budget Committee, the Civic Appointmens Committee, and the Government Management Committee. He has also worked with multiple agencies, including Build Toronto, Etobicoke York Community Council, and the Canadian National Exhibition Association. Politics — and easily flushed faces — might not be the only thing that runs in the Ford family: Doug has also been linked to drugs. A Globe and Mail report from last year claimed that Doug sold hashish out of his affluent suburban home in the 1980s. Doug called the story an "outright lie." This isn't the first time Doug has faced the possibility of becoming mayor of Toronto. This May, when Ford checked himself into an alcohol rehabilitation center, rumors swirled that he would drop out and that his brother, Doug, would take his place. Back then, it was viewed that Doug, who has always been Ford's chief adviser, and his little brother were a two-for-one deal, The Toronto Sun reported. So if Doug's chances are anything like his brothers, then that would put him at second place behind conservative John Tory. A poll released Wednesday showed that front-runner Tory was ahead with 40 percent of the vote while Ford trailed behind at 28 percent. Doug will have a little over six weeks to campaign in hopes of edging out Tory. What Do Torontonians Think of Him? We all know what Toronto — and the world — think of Rob Ford, but what about Doug? Judging by the reactions on Twitter, some are going to miss Rob's unparalleled antics; some are opposed to any more Fords in office; and others won't be able to tell the difference.